Hello friends, it is time for the ultimate link building guide which is 100% natural. If It's organic, It means Google loves them and If Google loves organic links then it means unlimited traffic from Google. There are lots of ways to create backlinks, but 1 Quality backlink is always better than 1000 low quality ones. In this post I am compiling 10 best and easiest ways of generating organic backlinks. So far, below listed ways are all organic and SEO friendly without a single % side effects/harms. Just read this guide and start getting your dream backlinks. Infographics are the golden key to success for almost all. Infographics are are easier to get viral and all big and popular companies are using it for their online promotion. It is the best way to get quality backlinks from Authority sites. To do so, you need to create an eye catching Infographic so that people will get attracted towards it. Your Infographic should be full of good quality information. So, here I am providing a simple and short guide to create Infographic which is easy to get viral. Info-graphics are also one of the greatest ways to generate huge organic traffic. So what are you waiting for? just start making Infographics and see results from the first day. How to create Infographics that may easily get viral? Great Design: The very first step is to create a beautiful eye-catchy Infographic with a beautiful design. You can hire an Infographic designer if you don't have time. Information: The 2nd most important thing is well researched infographic. A we all know that infographics are full of information which are easy to read. Like If you don't have time to read a 2000 word Blog Post, you may refer to a infographic and can get all information in brief. That is why your infographic should contain well researched with statistical data for better performance. Promotion: Initially you need to promote your Infographic to the right audience and then they will promote it without charging you any money. For example, if your Infographic is about India's progress since 2014 then you need to approach current Government supporter and they will surely make your Infographic viral. Also, you can use social platforms like Facebook, Twitter and Google plus for fast results. Now, check who is using your infographic on their websites, if they are giving you credits for your work, then its great otherwise ask them to give you credit for your work. If they are not providing you any credit then you can file a copyright case. No doubt, visuals are always better and easier to understand than plain text. The Popularity of YouTube is a big example, why videos are a great way of getting popular in no time. Create a video and publish it on YouTube or post it on your website. After that Submit your video link to video sharing sites and get backlinks from those sites. If your video is great, then most probably other will try to embed your video on their site and yes, this is the time you will get a quality organic backlink. Again, check regularly if users are using your videos without giving you credits or not. Case studies, comparisons, like blog post need lots of research. The more research it is the more credible it will become. People love to read then and Now type blog post to see how much change is there in the market. This type of research blog post attracts lots of quality and natural backlinks. This is a complete researched case study by Dmitry Dragilev. In this post you can learn lots of tricks and tactics like Create good content, reach out to link prospects, and use strategic guest posts to get your page to rank. This type of post is known to attract Links as well as Followers for a blog. Interviews are known for their success. Just find popular people in your niche and do an interview. The best way is to attend the events where important people of their niche are coming, meet them and ask some important questions. Make a blog post about that interview and then You will start gaining readers as well as Backlinks for that article. There are many people who want to know something new about their favorites. So, start writing Interviews today if you want to get success in blogging. Harsh Agrawal, a ProBlogger and Entrepreneur from India and Inspiration for millions of bloggers. 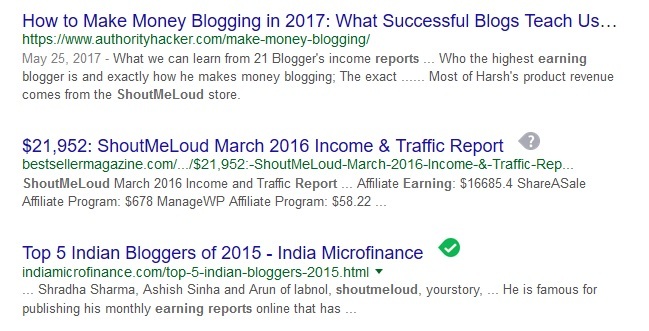 A good interview with Harsh by Anil Agarwal founder of BloggersPassion helped him in earning thousands of quality backlinks and followers to his blog. As you can see "One Link" is given to his interview Blog post by me. Similarly, you can start writing interviews for quick success. In Blogging niche, we always say Content is King. Always write good quality content with as much detail as possible. Usually if you want to rank better in search engines, the lengthy and detailed articles always outrank short content blogs. The more detailed is your article, the more trust it will gain by visitors and also high chances for earning quality backlinks from trusted and top sites. this is what we all are looking for. In this blog post, it is mentioned that blog post with 2450 words gain better ranking than shorter blog posts. While most SEO experts always try to write more than 1500 words. Also note that google penalize poor contents regularly and prefer high quality researched articles. So, from today onward, Start writing detailed content and make good quality organic backlinks. List type blog post are successful way of earning quality back links. I have tried this method and got success every time. What you need to do is, make a list of the top people of a niche, give them rank on your blog. There are many people who love to share that they have been mentioned here. People who are mentioned by you in your blog will be sharing your blog on their social platforms too. In the above link, there is mention of top 12 travel bloggers in India. This post got huge success as all 12 bloggers shared that blog post on their blogs or on social media platforms. Also keep in mind that you are making lists of only genuine people or otherwise you will lose credibility for your article. Alexa ranking helps you in making some good back links, however you need a good site ranking if you want to earn backlinks. There are many websites who make lists of sites from Alexa ranking and from those websites you will be getting links. You just need to score high in Alexa ranking and soon you will start getting good backlinks. Also one can earn one quality backlink from site search page of Alexa. Current trends or hot trends are good for huge traffic in less time. However, current trends are not organic contents and will get old in few days or weeks. But still they are good sources of generating quality backlinks, and you just need to be faster than others. Just write something good on a hot trending content before others and then other people will start giving you credits for your work. Be active on news sources and also on google news. And if you are on twitter then it is best because twitter is best source of super trending news. Post Leaks about a product or a service just like Evan Blass (@evleaks) do. He use to give leaks about products before official confirmation by brands and is well known for his accurate leaks. What you can do is tie up with brands and then you can ask for leaks and write them on your blog. After that, news sites or other blogs may pick your leaks and then you will get huge popularity. However, getting leaks from brands is the most difficult task. It can be easy if there is a friend working with that brand. It is one of the great way through which you can get good followers as well as quality links to your blog. This is also a great way of getting famous in your niche. There are many people who write about top bloggers earning and you may get a chance to get featured there, also there are many news sites which can ask you for interviews. Hence Sharing monthly earning reports is a good idea. Harsh Agrawal use to share his earning reports and those reports are also earning lots of page views and active followers. You can see in the above image as people are also writing articles on Harsh Agrawal's income and sources. This way, ShoutMeLoud is earning Backlinks and it is all in an organic way. I really like what you mentioned in the early part of your article that 1 high quality backlink is better than 1000 low quality backlinks. This is where google beats most people. After reading all the 10 well eloborated points, I have got a pretty clear picture of how to execute my new SEO strategy to get high quality backlinks. Thank you for sharing it with us sir. It was very nice of you to share this, it will help me a lot. Useful article. Thanks for sharing this useful information. Its helps to build my website.